On the cold morning of February 23, 2013, the scouts and adults/leaders went on an overnight backpacking trip to the Ojai back country, to Pines/White Ledge. We left our meeting up place, Big 5 parking lot, at about 7:30 AM to drive to the trailhead. When we arrived, we picked Vaughn as our trek leader. He did a great job, even though he is a younger scout. Our time getting to the pines camp was a short time of about 2 hours. When all the scouts arrived, we started to set up our tents and ate lunch. The older scouts decided to go on to their camp at white ledge. When they left, the younger scouts started to work on sign-off’s for rank advancements. While they were doing that, a group of 3 people, Nick S., Mr. Johnson, and Riley B. went to gather some wood for the night’s fire. As they were cutting wood, they found a hidden geo cache in a hollow tree. Afterwards, when we got enough wood, Von and Jason each started a fire for the adults and the scouts (as a sign-off). Everyone had a quick, but yummy, supper and then the scouts went to bed and the adults stayed up a little bit to talk. In the morning, about 7:00 AM, we all ate a rapid breakfast and packed up for the hike down. The hike down wasn’t eventful, but it was fast and tiring. As soon as we got to the cars, we drove to a school to wait for the older scouts from white ledge. Once they showed up we ate lunch and drove home. The hike was 5 miles, round trip, with 2,133 feet of elevation gain/loss. On the white ledge trip, we hiked up past the pines, and up to the top of the ridge that overlooked the pines campsite. On the way up and over the ridge, we saw several patches of snow and it was very windy in places. We ate lunch near the top of the ridge where some scouts made snowballs. We then hiked over the ridge (at the top was a spectacular view) and back down, down, down to the white ledge campsite. The campsite was shaded and never very windy, because it was sheltered by trees, although the tops of the trees were swaying back and forth for most of the night. We had a great big fire to warm us up in the night. Most scouts went to bed before 8 O’clock, which is very unusual for scouts especially on an “older scout” trip. The next morning we hiked out of the canyon to a beautiful, sunny day. On the hike back down, we saw several other people hiking up and even some horses. Once we got to the cars, we drove back to the pines group at a school where we ate lunch. The hike earned each scout/adult 12 miles, with 4,252 feet of elevation gain/loss. This coming Saturday, March 9th, is the Scouting for Food bag pick-up. We need EVERYONE for this event. Last Saturday we dropped fliers and bags off in the community near St. Mark’s and we will (hopefully) have thousands of pounds of food to pick-up. To that end, we will also need parent drivers to help collect the food the scout collect from the houses and bring it back to the church. The more scouts and parents we have, the quicker this will go. This Saturday, only 11 of the 40 scouts in the troop helped; we need to do better than that for pick-up! Given the success, both within the Troop and the community, we will be replicating last year’s finale, where the scouts – and leaders! – hike as much of the food as possible to the food bank. This is a short, flat hike of only 1.7 miles and will count as this month’s day hike. It’s also a good reminder of how fortunate we are as Americans. In many places in the world, people have to walk miles, every day, to access clean water and fresh food. So be sure to bring your (empty) backpack with you when you show up! Food and refreshments will be provided at the Food Bank as a reward for everyone’s hard work. This is not only one of the premier service events that the Troop participates in (the Food Bank annually serves approximately one-quarter of the population of Santa Barbara County), it’s also a competition within the South Coast District. Troops are awarded prizes for the most pounds collected, both as a whole, and on a per registered scout basis (Troop 26 currently has 40 registered scouts). Scouts and families are highly encouraged to go through their own pantries and talk to their neighbors for non-perishable food donations. Moreover, some scouts in the past have taken advantage of a family trip to Costco to procure helpful and heavy items to donate (30 lb bag of rice anyone?). If every scout donated 20 lbs of food, the troop would immediately raise 800 lbs of food without visiting a house! The troop has placed to large collection boxes for food at the church, so feel free to bring any donations to Tuesday’s meeting, especially if your scout is going to be unable to participate on Saturday. Finally, when the Food Bank is low on food, they often buy food from other sources in the community and they have a formula as to how many pounds of food each dollar buys. Therefore, for those with no unwanted food sitting around, the Food Bank is happy to accept monetary donations (cash or check) and will convert those dollars into pounds toward the Troop’s total weight. Last year we lost the crown by less than 200 lbs of food. Let’s win it this year! 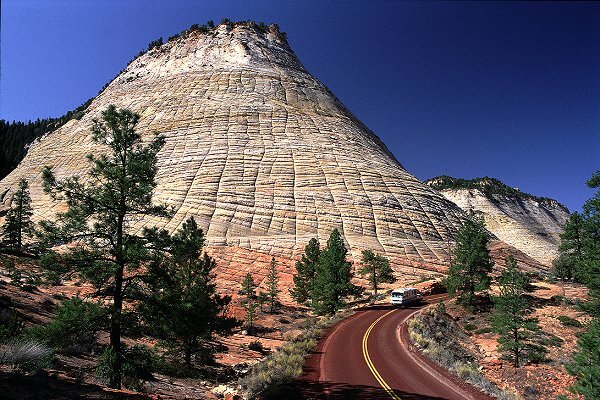 As a reminder, sign-ups for the troop’s spring break trip to Utah (Zion & Bryce National Parks) are closing this coming Tuesday, March 5th). At that time, a $100 deposit is due to help cover the troop’s up-front costs (namely: food). The balance, $90, is due at the troop meeting before the trip, on March 18th. For those that have forgotten, this trip is going to be FAN-TASTIC, full of some of the most wondrous geologic formations in the world. 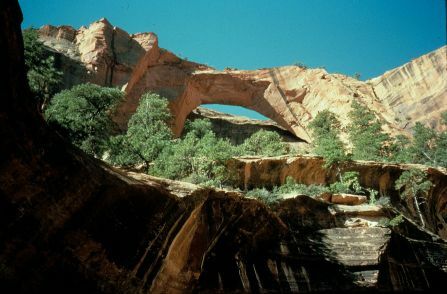 In Zion, we will be hiking to Kolob Arch and Checkerboard Mesa. 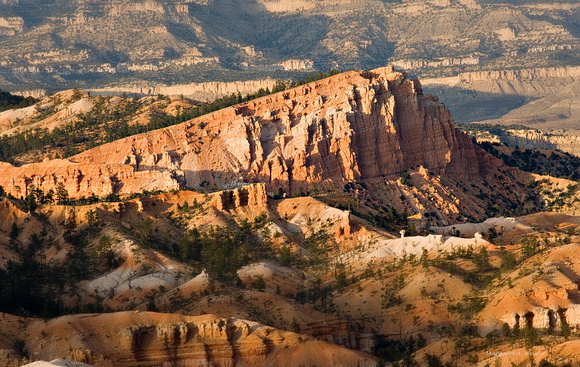 In Bryce we will be seeing Thor’s Hammer and Queen Victoria in her garden, hiking the Fairyland Loop, with it’s unreal landscape, and hopefully catching site of the Sinking Ship. If you think those photos are amazing, just wait until you feast your own eyes on those sites; no photo can do them justice. While the trip will likely be on the “chilly” side of things, in my opinion, a dusting of snow only makes the landscape all the more spectacular. Besides, in the summer it’ll be like hiking in a furnace! As always, we highly encourage parent attendance, and it’s not just for your vehicle (but it helps). This is a great opportunity for those parents less inclined towards backpacking to get out and see their scout in action. For those that like the backpacking… well, this will really be a vacation then. But seriously, if you want to go and are willing to drive, please sign-up and let us know. We always strive to include the most amount of people using the fewest vehicles. After a great Spring Break Trip to Utah, in lieu of April 6th’s Day Hike, our troop along with other troops in our council is required to visit Rancho Alegre and help do some work around the facility to prepare the camp for this year’s Camporee. This work day at the Rancho Alegre Camp counts towards the troop’s Camporee score, so a good turn out is required in order to get the highest score possible. Please meet at the Big 5 parking lot at 7:00 a.m. Wear work clothes and bring gloves. In addition, please bring gardening tools (i.e. rakes, pruning shears, etc.) to help with the clean up. Please bring a sack lunch, water, and 10 hiking essentials. We will return from Rancho Alegre at approximately 12:00 p.m. We will need drivers for both directions. Sorry to sound like the government during tax season (ugh! That’s next month… sorry for the reminder), but it’s time for the final payment of $200 for summer camp at Emerald Bay. I apologize for the unusually brutal payment schedule this year, but in order to secure the best (i.e. least expensive) pricing for everyone, the troop’s reservation must be paid, in-full, by March 10th. To that end, Mr. Johnston will need to send off a check at the conclusion of the meeting on Tuesday, and I need to be as sure as possible that the funds will be there to cover it. If you are having difficulty with this, please either let me, the Committee Chair (Jerry Ball), or the Treasurer (Susan Swider) know, and we’ll work something out. Also, a few people have asked about Merit Badge sign-ups. These should be coming some time later in March or April. Fortunately, Emerald Bay does their merit badge classes differently than other camps and doesn’t limit class size ahead of time. They have open sign-ups, then move councilors around to meet the demand for the various badges. That said, getting our troop signed-up early as possible is always a good idea, as there are some classes that are equipment limited (like Archery, and Rifle & Shotgun Shooting). As soon as I know the date sign-ups open, I will let everyone know. Younger Scout Sierra Trek 2023**** is scheduled August 4 through 11, 2013 and planning is underway. The destination will be Humphreys Basin, John Muir Wilderness. To participate on this trek, you have to meet the 60 % participation rules**, (60% of Day Outings/Backpackings and 60% of Overnight Campouts). When temperatures plummet and snow starts to fly there’s no reason to shiver and shake. You can keep dry and warm by dressing properly and adjusting to changing conditions. Comfort in the cold requires attention to details, and more than anything that means layering your clothing from the inside. The trick to layering is to combine the right clothing in the proper order, trapping the air warmed by your body heat while letting moisture vapor from your body’s perspiration be conducted away from your skin. The choice of garments must be versatile enough to adapt to your activity level and variation in weather conditions – maintaining the delicate balance of staying cool when active and warm when at rest. The first layer for cold-weather exposure should keep you warm and dry on the inside. Since it’s what touches your skin, it also makes sense to wear something soft, lightweight and pliable (those who have been chaffed by wool underwear will attest to this). This layer, the underclothing, will work with your other layer to keep you dry. The best material for long underwear is those that “wick” wetness away from your skin quickly and effectively. If you’re thinking about wool or cotton underwear for cold weather, you might think again. Both fabrics dry slowly, holding heat-draining moisture against your skin. But there are a wide range of superior fabrics available now which can wean us from our past mistakes. Today’s synthetic fibers, polypropylene and the like, work much better. Not only do they feel comfortable against the skin, they dry quickly and actually pull perspiration vapor away from the skin towards the next layer of clothing, the insulation layer, where it can evaporate. The secret to staying warm and dry when temperatures dip – or when you’re activity level tapers off – is to make sure you’re well insulated against the cold. The moisture that’s moving away from your skin has to keep moving. The best insulators will trap warm air, but offer necessary ventilation when you start to overheat. Clothing that gives you the best insulation should be comfortable and lightweight – durably windproof and adaptably breathable. GORE Windstopper® fleece is such a fabric commonly used by leading manufacturers. Here’s another tip on insulating: Incorporate as many layers as necessary to stay ahead of the cold, and control your heat retention by adding or removing layers as needed. It therefore makes sense to buy garments that are easy to put on and take off. Versatility of the layering system is key. For example: When hiking, you can expect to be active for extended periods of time in cold weather. Start your day wearing a wicking layer and an outer shell. It may be a little cold to begin with, but your body will warm rapidly and begin to perspire. When you stop hiking, add an insulation layer to remain warm and comfortable. The third or outside layer is your last line of defense, so outerwear should be appropriate for your activity. Jackets and pants must allow perspiration vapor to vent while blocking wind and rain. The material must reduce heat loss and assist the rest of your layers in keeping you dry and comfortable. Over twenty five years ago, an outer layer – or shell – that was capable of protecting you from wind, rain, and snow while letting perspiration escape simply wasn’t available. Most people wore rubber of plastic suits for rain protection, but these materials trapped sweat, made the insulation layer wet, and kept the wearer chilled. Because they weren’t breathable, your options were to get wet from the elements or get wet from your own sweat. The invention of GORE-TEX® fabric revolutionized cold-weather outerwear. Able to withstand the most severe rain and snow while allowing perspiration vapor to escape, GORE-TEX® fabric has proven to be durable and windproof for wide range of physical activities. Today there are several effective performance fabrics available. In the process of making your choice, consider your activity and the level of protection you expect. Make sure the shell is large enough to fit easily over the other layers and that it is easy to car for so that you can maintain its elements of layering and, with luck, you’ll never endure another uncomfortable day on the mountain. 3 Tbs. of oil in skillet, add mushroom and cook until golden. Add garlic and dried thyme to mushrooms and cook one minute. Season with salt and pepper. Add to pasta and simmer 2 minutes. Stir in 1 Tablespoon olive oil and sprinkle with grated or shaved Parmesan cheese. Our next Parent Committee meeting is this Tues. March 5th. The meeting will start at about 7:15 after the Troop announcements. Next Saturday, March 9th, the scouts will be picking up food donations for the food bank. Your scouts are encouraged to bring some canned goods from home as well. Last year the scouts collected almost a ton of food. Let’s see if we can get all our scouts to participate in this great community service event. The Spring Break trip to Utah is coming up. Sign ups will close 3/5. Remember to get your deposits in. Looking ahead to April, there will be a work day at Rancho Alegre April 6th.